Pes(o)soa de Carne e Osso (2010). Photographic documentation of an urban 8-hour durational performance installation held at MOLA Festival, Salvador de Bahia, Brazil. Santiago Cao, Pes(o)soa de Carne e Osso, Salvador de Bahia, Brazil (2010).Photograph © Juan Montelpare. Lives and works in Buenos Aires (Argentina). 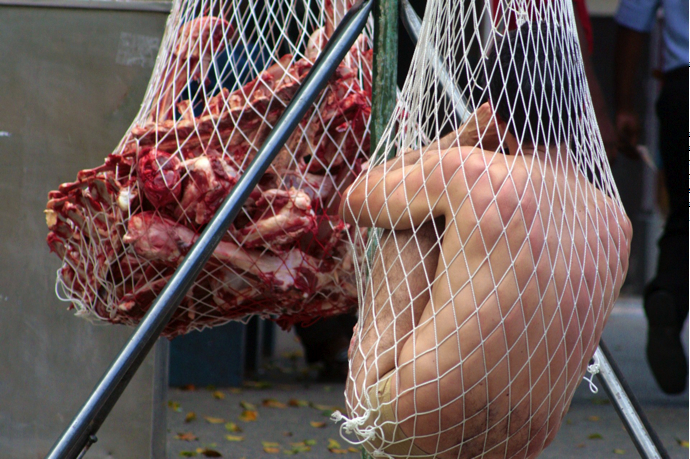 Santiago Cao, one of Latin America’s most provocative young Performance artists today, places in his durational urban performance installation Pes(o)soa de Carne e Osso the questions: How much does meat weigh? And how much does the person behind this meat weigh in a society that negates and annuls people? In prostitution, men and women are simple objects of consumption. In business there are no people; only Human Resources. In colonial times, slaves were treated as merchandise, not as people.